Stayed with my family of five (three teenagers). Location is great just across the bridge from the main old city of Verona. Easy walk. We were out till 1am and felt safe walking back. Apartment was easy to find with directions given, check in was simple. Our room was clean, big and beds very comfortable. Air conditioning and Wi-Fi all worked great. Shared bathroom was fine. Had a great little breakfast left on the table in the morning. 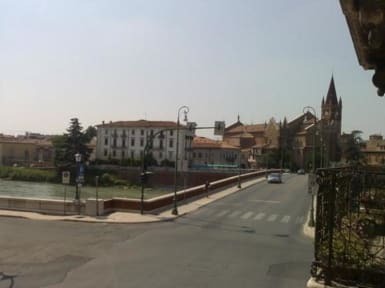 Ideal location just minutes from the town in Verona, a lovely flat with a nice kitchen and balcony. Not sure why this place had a few bad reviews as for the price it was perfect! This is a beautiful and calm apartment with different rooms in the middle of the historical center. We were very happy here and definitely recommend a stay! With the staff we didn't really interact, so we didn't get to know anyone. Could be a bit more personal here. Cheap and cheerful. I stayed for one night and it was perfect for what we wanted. A central location on a stop off in Verona. I have seen a few complaints about notes being left telling people not to complain about the conditions. The note says to let the owner know at the time, instead of writing a review a few days later. Which makes perfect sense. If you notice something, say it then and there and have it changed instead of giving a poor review later. I would stay again. Wonderful location, great price, perfect for any traveler looking for an adventure! It is not the Ritz, but what fun is that anyways. Would stay here again in a heartbeat. Staff was nice and helpful, the hostel was in a great location. A few complaints, the shower was a little run down (I.e. there was no way for the shower head to be held up on its own) and the breakfast was only packaged croissants and instant coffee. There were quite a few signs posted basically telling customers not to complain... which was kinda weird and rude. Overall it was an okay place to stay for the money but we would not stay there again. Good location, 10 minute walk from the city center. We had a 3 bed room, with an air condition that did not work. The facilities were not as expected. The breakfast was a crossiant and a coffee, which was okay. Overall the hostel was fine, especially considering the price, it was one of the cheapest ones. Ho soggiornato in questo ostello con il mio fidanzato per 2 notti e l'esperienza è stata terribile! 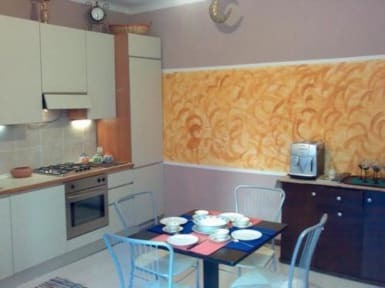 Abbiamo pagato 200€ e l'alloggio non valeva assolutamente questo prezzo. Colazione al quanto inesistente, lenzuola tutte stropicciate, niente copri materasso e non siamo riusciti a capire se la stanza fosse stata pulita o no. Niente donne delle pulizie, solo un ragazzo che lava gli asciugamani e lenzuola nella lavatrice. Igiene 0. Potrei aggiungere molto altro ma mi fermo qui. We were not too impressed with the hostel because of the facilities. Expecting bed and breakfast, you receive a plastic wrapped croissant and instant coffee and tea bags but there is no kettle! It was a little strangely situated, you wouldn't know it was a B&B, and there were little ants in the room. We booked last minute and paid 64 euros for a double room with a shared bathroom, but the small print also on arrival you have to pay 2.5 euros per night as a city tax. I wouldnt stay here again.